After almost 3 years of waiting, Tesla Model 3 reservation holders in Europe are now getting their first opportunity to drive the vehicle ahead of the start of deliveries. There are currently two cargo ships making their ways to Europe with Model 3 vehicles in order to start European deliveries. Yet, several Model 3 vehicles have been spotted over the last week in Europe. It looks like those vehicles are going to be used for test drives in many markets. Electrek received several reports from Model 3 reservation holders across many European markets who received invitations from Tesla to go test drive the new vehicle. 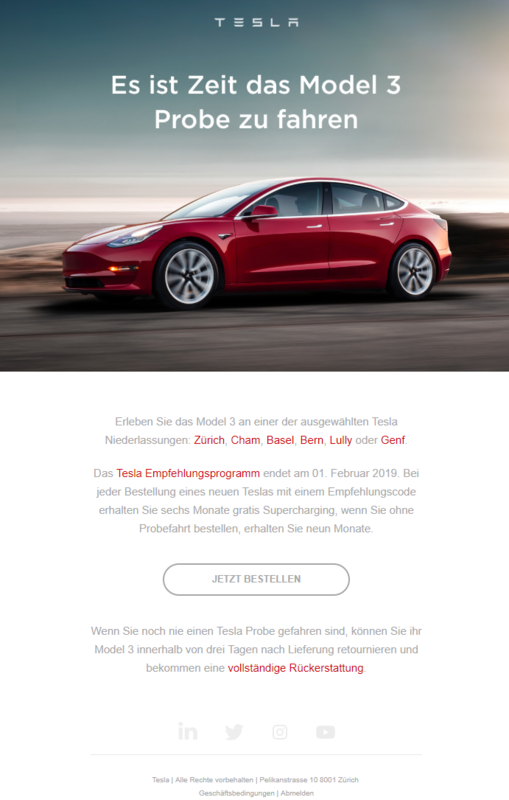 Tesla appears to be building a test drive fleet across Europe and it is sending invites in almost all European markets – though the invites appear to be limited to reservation holders. It is a similar rollout that Tesla did in the North American market last year. As we previously reported, Tesla received almost 14,000 Model 3 orders in Europe as of earlier this month. That’s only from reservation holders and the number is expected to grow since Tesla has now opened Model 3 orders to the public in Europe and China. Earlier this week, Tesla received European homologation for Model 3 and the first two shipments are expected to arrive in Norway and Belgium in the next week or two. Deliveries should follow quickly after and Tesla is expected to need a few weeks to work through its backlog of reservation holders before fulfilling orders from the public starting in March.